Hailing from Miami, Florida Farnell Newton finally moved to Portland, Oregon. He has performed regularly with musicians such as Mel Brown, Thara Memory, Bobby Torres, Johnny Polanco, Ricardo Lemvo, Darrell Grant, and is now member of Mike Phillips band. He also recently performed as trumpeter for the 2009 Soul Train Awards house band. He is also an adjunct professor of Jazz Studies at Portland State University and run a high school jazz youth program (PDX Jazz Project) on the weekends (www.pdxjazzproject.com). His first solo album Sense of Direction was released in 2006 on Diatic Records. His newest album is entitled Class Is Now In Session (2011). The album could be created with the support of 133 backers on Kickstarter, which is obviously the model for future releases. With the intro Class Is Now In Session Farnell brings us really in the mood, reminiscent of his academic reference. With elegant sweetness he presents the Urban flavored Bump. How much recording technique is progressed in overdump, is amazing. Guitarist/composer Donnaloia, of the big band Grooveyard, adds sizzling chords to the song. Newton dedicated as loving father Daddy's Little Girls to his family. Jade, Jewyl and Jazmyn inspire her father to peak performance on the trumpet. Embedded in a fine horn arrangement singer Jarrod Lawson shines on Everything Is Clear. Jarrod has shared the stage with such international acts as Average White Band, Maceo Parker, Angelique Kidjo, Bilal, and Olivia Warfield. On the interlude Recess Newton expands to Hard Bop, while A Child Not Yet Born offers temperate jazz. Greg Goebel shows his evident brilliance on piano. Goebel currently records and tours with singer Gino Vannelli. His contributions can be heard on the CD, The Best and Beyond. American jazz and concert music composer Wendell Morris Logan composed Groove Easy. On his Oberlin College profile, Logan described jazz as "our classical music" and said that it "belongs here just as much as Americans belong on this soil." Newton dedicated his interpretation to this great composer, who died in 2010. Love Games is Newton's return to R&B featuring singer Michael "Beatzilla" Whitmore. In 2010 he was involved in making of Tony Ozier and the DooDooFunkAllStars 1st release Keep The Funk Alive. Newton exposes his muted trumpet against a veritable horn arrangement. Newton delivers a smashing duel with Alex "Popcorn" Milton on Funky Horns. There is all, what you want. Intelligent phrasing, dynamic range, precise timing and an impressive composition. Baby Names features Seattle soul singer Toni Hill in a typical R&B production. Toni recently garnered rave reviews for her ear-tingling grooves on her debut album Only Love. On The Bluest Eyes Revisited Newton surprises with a changeover from traditional jazz to hip-hop haunted nujazz. 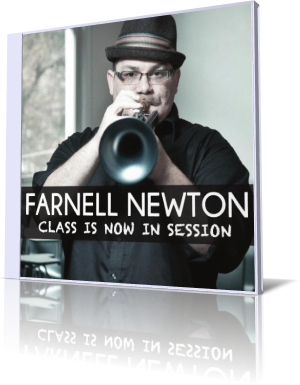 Farnell Newton's album Class Is Now In Session is an ambitious work stimulating mind, intellect, and emotion in the same way.